Maximillian Weisner Starks IV (born January 10, 1982) is an American former college and professional football player who was an offensive tackle in the National Football League (NFL) for ten seasons. Starks played college football for the University of Florida. He was drafted by the Pittsburgh Steelers in the third round of the 2004 NFL Draft, and also played for the NFL's St. Louis Rams. Starks was born in Orlando, Florida. He attended Orlando Christian School for sixth to eighth graders, where he played basketball and volleyball for the OCS Knights. As an eighth grader he wore size 15 shoes—when he had a difficult time finding shoes that fit he borrowed shoes from NBA star Shaquille O'Neal, who played at the time for the Orlando Magic For high school, Starks attended Lake Highland Preparatory School, a private prep school in Orlando, where he is the only high school football player in the history of the Highlanders to become a pro athlete. He was one of the state's top offensive linemen in 1999, and was named to Super Prep's, National Bluechips and Prep Star's high school All-America teams, and a USA Today honorable mention All-American. He was a two-time all-conference selection in basketball. Starks accepted an athletic scholarship to attend the University of Florida in Gainesville, Florida, where he played for coach Steve Spurrier and coach Ron Zook's Florida Gators football teams from 2000 to 2003. During his time as a Gator, he won a Southeastern Conference (SEC) championship ring (2000) and blocked for record-setting Gators quarterbacks Rex Grossman (2000–2002) and Chris Leak (2003). As a senior, Starks was a team captain and first-team All-SEC selection. While he was a Florida undergraduate, Starks was a member of Alpha Phi Alpha Fraternity. He graduated from the University of Florida with a bachelor's degree in sociology in 2007. Starks was among the largest NFL players, standing at 6'8" and 370 pounds with size 19 shoes. Four other relatives of Starks have been professional football players. He was drafted in 2004, round three, pick 12, by the Steelers. He became a starter for the first time in the 2005 season for the eventual Super Bowl Champion Pittsburgh Steelers. Entering the 2007 season, Starks lost his starting job to Willie Colon; however, he played in all 16 games. He also started 4 games at the end of the season at left tackle in place of the injured Marvel Smith. On February 21, 2008, the Pittsburgh Steelers placed the transition tag on Starks. He signed his one-year, $6.85-million tender offer on April 19. He signed another one-year contract with the Steelers following their victory in Super Bowl XLIII. On June 23, 2009, the Steelers signed Starks to a new four-year, $26.3 million contract. The deal included $10 million in guarantees. 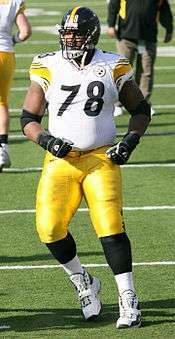 He was released by the Steelers on July 28, 2011, but was later re-signed on October 5, 2011. After the season he worked on the rehabilitation of a knee injury and said he hoped to return to the Steelers for the 2012 season. In July 2012, he announced on Twitter that he had re-signed with the Steelers. Starks started all 16 Steelers games in 2012. Starks signed a one-year contract with the San Diego Chargers on May 21, 2013. He was released on August 30, 2013. On September 18, 2013, Starks signed a one-year contract with the St. Louis Rams; he was released on October 1, 2013. On August 1, 2014, Starks signed with the Arizona Cardinals. He was released on August 25, 2014. He announced his retirement from professional football in January 2015. Starks is the son of former professional defensive lineman Ross Browner. Starks discovered he wasn't the biological son of Max Starks, III, his stepfather, when he was in high school. Ross Browner, who was a first-round selection in the 1978 NFL Draft by the Cincinnati Bengals, started 36 of 43 games during his career. Browner was a two-time (1976, 1977) All-American defensive lineman at Notre Dame and won the Lombardi and Maxwell Awards. The Browner family as a whole has had more players in the NFL than any other family. Ross's brothers Joey Browner, Jimmy Browner, and Keith Browner all played in the NFL. Starks's cousin, Keith Browner, Jr., plays with the Houston Texans. Starks appeared in Chunky Soup commercials eating soup with Steelers back-up quarterback Charlie Batch, defensive tackle Casey Hampton and others. In 2006, he traveled with Seattle Seahawks defensive end Bryce Fisher and Atlanta Falcons defensive end Patrick Kerney on the USO Tour, traveling to United States military bases, a tradition begun by such NFL greats as Frank Gifford and Johnny Unitas. In 2005 Starks visited the USS Theodore Roosevelt at sea, along with members of the Cincinnati Bengals coaching staff. Starks was heavily involved in the local community at the University of Florida. He served as a tutor in Gainesville, Florida and worked with Kids Against Drugs, Alcohol and Tobacco. Starks also became involved with the charity Cents of Relief which works to prevent human trafficking and allow access to healthcare for vulnerable populations, particularly women of prostitution and their children. He currently serves on the charity's Board of Directors. ↑ Pro-Football-Reference.com, Players, Max Starks. Retrieved March 28, 2011. ↑ Haugh, David (January 31, 2009). "Pittsburgh Steelers' Max Starks bonds with father Ross Browner". Chicago Tribune. Retrieved May 2, 2011. ↑ databaseFootball.com, Players, Max Starks. Retrieved March 28, 2011. 1 2 3 4 GatorZone.com, Football History, 2003 Roster, Max Starks. Retrieved March 28, 2011. 1 2 2011 Florida Gators Football Media Guide, University Athletic Association, Gainesville, Florida, pp. 97, 125, 185 (2011). Retrieved August 28, 2011. ↑ "Steelers release Starks, Randle El". Sacramento Bee. Retrieved 29 July 2011.